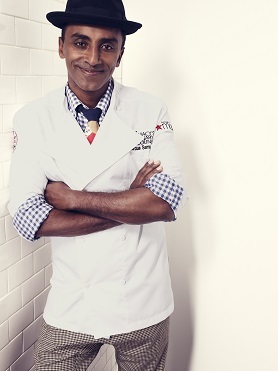 Meet Macy’s Culinary Council Chef Marcus Samuelsson! Celebrate the opening of Culinary Council Chef Marcus Samuelsson’s newest project, Marcus B&P, with a fun evening of nibbles, noshes, and more with the man himself at 6 pm on November 15 at the Macy’s in Jersey City! Your $20 ticket gets you access to the event, a $10 Macy’s gift card, a $10 Marcus B&P gift card, and a copy of The Red Rooster Cookbook (affiliate link). Plus if you introduce yourself to me, you get to hang out with me… haha who doesn’t want to hang out with me. This post is sponsored by Everywhere Agency on behalf of Macy’s; however, all thoughts and opinions are my own.